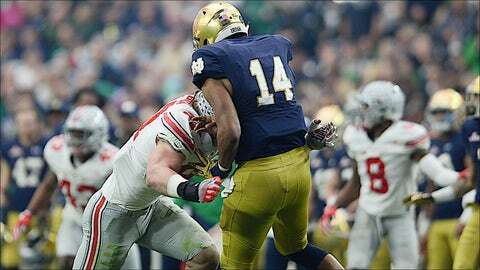 Ohio State star Joey Bosa's college career ended with this targeting penalty in the Fiesta Bowl against Notre Dame. Replay officials are likely to have more power when it comes to calling targeting penalties in college football next season. The NCAA football rules committee proposed giving replay officials more authority to overturn incorrect targeting fouls and to call targeting penalties when they are missed on the field. The committee also agreed to allow conferences to experiment with NFL-style centralized video replay review systems in 2016. The rules committee completed four days of meetings in Orlando, Florida, on Thursday and announced several proposals that could be implemented next season if approved by the playing rules oversight panel on March 8. The targeting penalty was adopted in 2013 as a way to reduce helmet-to-helmet hits and potential head and neck injuries. The penalty for targeting is 15 yards, plus ejection of the player who committed the foul. While officials say the rule has changed player behavior, its application has drawn plenty of criticism from fans, players and coaches. There were 158 targeting penalties called in all FBS games last season. Forty-three were overturned by replay review and 115 were upheld. All targeting fouls are reviewed, but replay officials have been limited to reviewing only if there was forcible contact to the head and neck area and if the hit was made with the crown of the helmet. Under this proposal, how the contact occurred, whether the player launched into an opponent or whether the contact was more incidental, also can be reviewed. Replay officials also would be allowed to call targeting fouls missed on the field, though NCAA coordinator of officials Rogers Redding emphasized only blatant and obvious missed targeting penalties will be called after video review. "It’s not the case that on every play the replay official is going to scan the field to see what happened," Redding said. The SEC requested the opportunity to experiment with collaborative replay review, with officials monitoring games from a command center away from the stadiums. "This is the necessary first step and we will now further engage our membership to determine if and how we will implement this experimental opportunity," SEC Commissioner Greg Sankey said in a statement. "We look forward to communicating with other conference offices to discuss the most appropriate and effective implementation of collaborative replay. Our office has been considering various logistical approaches which will be finalized prior to the 2016 season if we decide to use this new experimental rule." Spokespeople for the Atlantic Coast Conference, Pac-12 and Big 12 said their members will discuss using centralized replay in 2016. ● Rules dealing with low blocks were adjusted to prohibit a player who leaves the tackle box from blocking below the waist toward the initial position of the ball. ● A ball carrier who slides feet first will be treated as a defenseless player. ● Deliberate tripping of the ball carrier (with the leg) was approved as a foul. The rules committee also proposed allowing the use of technology such as tablet computers or laptops during games in the coach’s box and in the locker room, but not on the sideline. Colonial Athletic Association Commissioner Tom Yeager said cost concerns about competing schools being able to provide similar technology led the committee to stop short of voting in favor of allowing computers on sidelines. The ineligible receiver rule was considered for a second straight year. Unlike last year, no changes to the rule were proposed, but the committee decided to instruct officials to more stringently enforce the 3-yard limit for offensive linemen when a pass is being thrown and to adjust how officials watch for linemen moving down field. Last season the committee proposed changing the limit to 1 yard, but the proposal was shot down by coaches. Offensive coaches led the opposition, while defensive coaches hoped for a change. There has been an increase in offenses using run-pass option plays that deceive defenses by having linemen block as if it is a running play. Defensive coaches have complained about the lack of enforcement of the ineligible receiver rule. Redding said midway through last season the conference coordinators of officials decided to change how the ineligible receiver rule was officiated. "We jointly made a decision … to continue to have the umpire be primarily responsible for the ineligible receiver down field, but then give secondary responsibilities to the head linesmen and the line judge," Redding said. "Those are the officials on the sideline who are right on the line of scrimmage. "The coordinators are telling the officials, `This is going to be a hard and fast 3-yard rule.’ We’re not going to allow some slop. We’re not going say, `If it’s 3 1/2 will give them that or 4.’"